Crag of Cajada. The cliff is divided into two sectors, one in plaque with difficult fingers and technical shots and the other overhanging with very beautiful and very physical routes. Access: From the highway before Longarone there is the village of Faè, where 50 m before a glassworks turn left and go up for 200 m then take a dirt road on the left follow it for 500 m and then turn right and find after about 5 km wall under which it stands. Gear: The riveting is excellent. 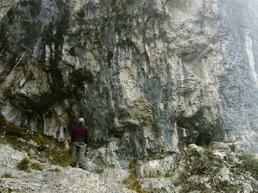 Rock: Vertical and overhanging limestone. Logistic: Attention: the crag is inside the Belluno Dolomites National Park, therefore the utmost respect for flora and fauna is recommended.